Home Guides & Cheats Civilization Beyond Earth: What Is the Best Virtue Tree? 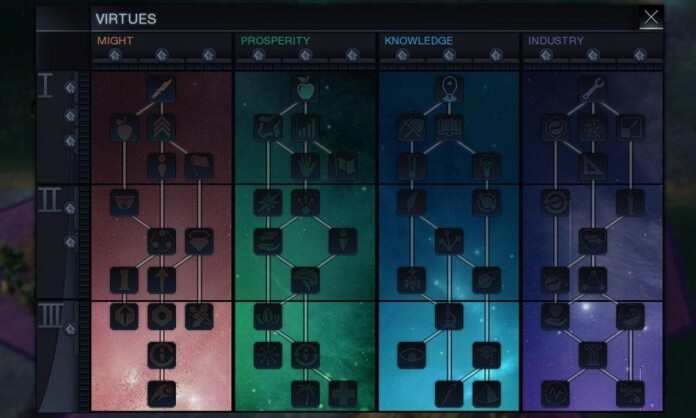 Civilization Beyond Earth: What Is the Best Virtue Tree? Virtues in Civilization: Beyond Earth are basically the Social Policies of the previous game, reworked and polished to look and be a lot different. However, with so many possible choices and an obvious impossibility to unlock them all, you might wonder which are the best virtues in Civilization: Beyond Earth – and we are here to try and answer that question. So if you’re wondering what virtue tree is the best to focus on during your game, wonder no more and keep on reading. Although usually choosing your virtues in Civilization: Beyond Earth is or should be based on your play style, at the moment of writing this I consider one of the virtues (one that I have originally ignored in my first few games) extremely overpowered. Combining it with trade routes (which are also a bit overpowered in my opinion) gives you amazing results and probably huge bonuses over the other civilizations. What’s this virtue tree? The Prosperity one. Although normally you would be tempted to choose anything BUT the prosperity Virtue Tree (with Knowledge, Industry and Might seeming the best alternatives, in this order), if you look closely at Prosperity, you will see just how powerful it is. The first five bonuses are indeed not amazing, but they are perfectly created for a starting civilization and growing will be encouraged (you start with 10% of your previous food after a citizen is born, you get faster workers and improvements, faster outpost growth and eventually a free Colonist). But things get even better: you unlock great Prosperity Synergy bonuses (like 10% city growth and extra health) and get Trade Route Bonuses (a ton of extra energy) and health. Health comes with bonuses of its own, so getting at least the first 10 Prosperity Virtues will offer you huge bonuses. Knowledge first (at least the first tier), closely followed by Industry and Might. It’s probably a good idea to stay a bit more focused on unlocking more basic bonuses in all categories rather than specializing on a specific virtue in this case but your focus should be on Knowledge for the Science boost. Might might not matter too much in the end if you manage to get the right techs and better troops than your opponent – and get there a lot faster than them, making the extra bonuses a bit less useful. But in the end, since this is the question that this article tried to answer, the best virtue in Civilization Beyond Earth is Prosperity, combined with a ton of Trade Routes to reap on all the benefits. It’s overpowered right now and most likely this will be fixed in an upcoming patch, so make sure you take advantage of it while it lasts. What about you? Which virtue seems to be the best choice in the game, in your opinion? Let us know by commenting below!